Virginia Reynolds Wright was born April 6, 1937 in Springdale, Utah, and died July 14, 2004 at Memorial Hospital in Long Beach after a battle with breast cancer. She married Roger M. Wright in 1958; he passed away in February of this year. They had two children: Douglas Bently Wright and Tisha Diane Wright. According to QHGS member Barbara Revo Brown, who had been friends with Virginia since junior high school, she had an inquiring mind and a sense of adventure. She often said she’d have to live to 125 to get everything done that she wanted to do. Virginia’s volunteer spirit was legendary in the community. She served Questing Heirs as its auditor. 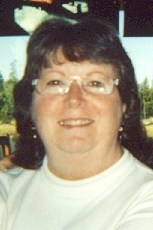 Virginia Reynolds Wright, born April 6, 1937 in Springdale, Utah, died July 14, 2004 in Long Beach Memorial Hospital. Widow of Roger M. Wright, survived by son, Douglas Bently Wright and daughter, Tisha Diane Wright. Virginia Reynolds sat in back of me quite often in the seventh grade. I was Barbara Revo—you do the alphabetizing. She was a little slip of a thing who ran around with Darlene Parker that year, both redheads, short, slim, and shy in class. We joined the same Girl Scout Mariner Ship that year, at Jefferson Junior High School, and I began to know Virginia a little better. Our group changed often over the years, but some of us stayed with scouting together throughout junior high and high school. Today, a solid core of ten of us—who have been meeting at least once a year since high school, thanks to Virginia’s organizing and planning skills—have a very strong bond with one another. Girl Scouting was one of her passions, and she led a troop, volunteered time, money, and energy to the GS Council in Long Beach. Even now, when most of us are grandmothers, she continued working at the GS Ranch House, doing her best to assure that the Girl Scout historical displays were accurate. She made strong friends working at the council. In fact, she made friends everywhere. Virginia had an inquiring mind and a sense of adventure. She loved TV, mysteries, puzzles, nature hikes, canoeing, exploring the unknown, tea, jewelry, telephone conversations, and feeling that what she did made a difference in her family, her neighborhood, and her community. For the most part, we Mariners went our separate ways after high school, until we were all educated, married and mothers. Education and life experiences in her early twenties gave her confidence and strength. Gone was the shy Virginia! She was active everywhere, and not timid about stating her views. This was a take-charge woman who had opinions on nearly everything, and would share them, usually tactfully. Some of the local groups which have benefited from Virginia’s clear, logical thinking, generosity and her time are: The City of Long Beach, Long Beach City College Foundation, the Third Council District, CERT, Long Beach Board of Education, Neighborhood Watch, Neighborhood HOA, Questing Heirs Genealogical Society, and the Assistance League of Long Beach, to name a few organizations for which she volunteered. She made a positive impact on her community. She was at home in a posh hotel, jet plane, cruise ship or touring by bus, water-skiing on a remote lake somewhere, or shooting target practice on the desert. A Renaissance Woman. Rarely reluctant to try something new, always well-informed about much in our world, she often said she’d have to live to 125 to get everything done that she wanted to do. She and I planned to do a Women’s Adventure to the Sea of Cortez to kayak with the whales and to learn Mexican cooking. Roger had no desire to see Antarctica, so Virginia and I were saving up for the cruise. We also wanted to visit the Galapagos Islands. It was her credo that at our age, we didn’t need more stuff but more fun. Her Christmas gifts were often I.O.U.s for some play, musical, or concert, to be attended with her, of course. We all see Virginia through our own prism, and I venture that we all smile at what we see. I miss her.